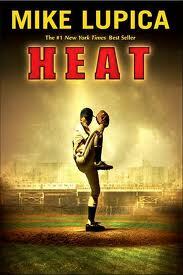 I have been looking for sports books for my avid sports fans and was so happy to find Mike Lupica’s book, Heat. If you’re a sports fan, particularly a baseball fan, this book may be for you. This book is about a 12 year old boy, Michael, who is a Cuban refugee. He, his brother and his father came over on a boat to Florida and are now living in the Bronx. Michael’s father was a baseball player in Cuba and dreams that Michael’s gift as a pitcher will lead him to play in the Little League World Series. But, all is not right in Michael’s world. His father has passed away, and his brother Carlos, 17, is afraid that the boys will be separated if they enter foster care. So, they hide their secret with the help of their elderly neighbor and Michael’s best friend, Manny. This book is full of great characters. Carlos, who is working two jobs to try to pay the rent and bills is the older brother trying to do the right thing and protect his little brother. Manny, Michael’s best friend is funny and loyal. Ellie, the very pretty girl who is also a big baseball fan is a mysterious character. Their neighbor, Mrs. Cora, is very warm and comforting. I found the writing believable and felt that my middle school son would be able to relate to the characters. Although this isn’t typically a genre I’d read, I couldn’t put it down. 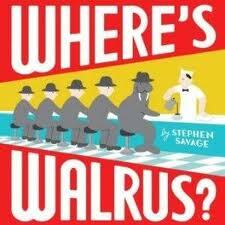 If you want to really get those preschoolers shrieking, read them Where’s Walrus. There are almost no words, just a walrus they have to find on each page. I didn’t realize exactly how amusing this book would be with our preschool class, but my goodness it was popular! Walrus is hiding in very funny place, as a dancer, as a bricklayer, as a painter in a park. That tricky walrus sure does know how to get children to laugh. The illustrations are great, like cutouts, with beautiful, bright colors, grey, red, yellow and teal. Highly recommended for young children. If you’re looking for something to quiet those chatty sixth graders, stand up, hold up the book Zoom, tell them that they’ll miss everything if they don’t watch every page, and start turning pages. With each page turn, my students ooohed and aahed until the end of the book. 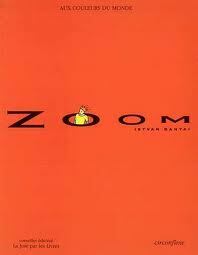 Zoom is a book that I find amazing in its concept, zooming in on the smallest detail and then zooming out over and over again. I absolutely loved it, as did my students. No need for words; and, the silence in that room was just bliss. 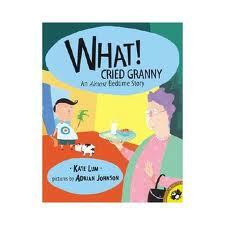 Highly recommended as a “read aloud” for older students. I’m always happy to hear recommendations from fellow librarians. This latest recommendation from my friend Helen was a huge hit with my second graders. 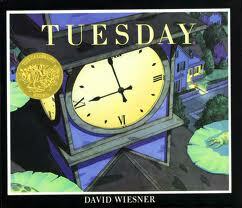 David Wiesner’s Tuesday is a wordless book that made my students laugh out loud. The text begins, with four simple words, “TUESDAY EVENING, AROUND EIGHT.” There are three panels of a peaceful pone and a turtle. The next two pages show flying frogs on lily pads. As you turn each page, you find very funny pictures of the frogs and lily pads flying through the town. Students are roaring with laughter at this point. Then, you see police detectives examine lily pads lying on the road. The next page of the book says, “NEXT TUESDAY, 7:58 P.M.” You see the side of a barn with the shadow of a pig. When the kids realize that now pigs will be flying through town, they are rolling on the rug laughing. The last page of the book shows, you guessed it, flying pigs. Such a fun, creative book. 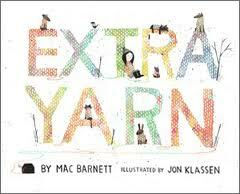 I have to admit that I’m a big fan of local Bay Area author Mac Barnett and also the illustrator Jon Klassen (I Want My Hat Back). Annabelle lives in a town with no color. One day, she finds a box with colorful yarn. She knits herself a sweater, when she has some yarn left over, she knits a sweater for her dog Mars. The yarn never seems to run out, and Annabelle never seems to stop wanting to knit. Soon her drab town is covered in wonderful color, everyone has a sweater (or a hat), including the bird houses, the trees, the houses, the pets. Color is everywhere. My students love watching the book come to life as Annabelle knits. But, like every great book, there is a villian. The archduke offers millions of dollars to Annabelle if se will just give up her magical yarn. When Annabelle says, “no”, the Archduke steals the box. My students love this book and are always quiet until the end, when they applaud. 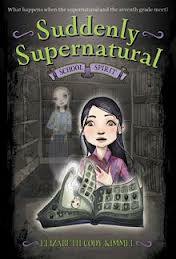 It’s a wonderful read aloud for all second to fifth graders in the library or just one on one at home. Have you ever tried to get a child to bed? Even now, my 12 year old struggles with going to bed. Imagine that you’re this incredibly nice granny, willing to do anything to help your grandson go to bed. Then imagine that his needs are UNending! This very funny book kept my kindergarten and first graders laughing and laughing as granny makes her grandson Patrick a bed (from scratch), a pillow (from scratch), a blanket and a teddy bear only to find that when he has everything he needs, it’s morning. WHAAAT! I’m not sure this book will put anyone’s children to sleep, but it will keep them laughing. Enjoy!